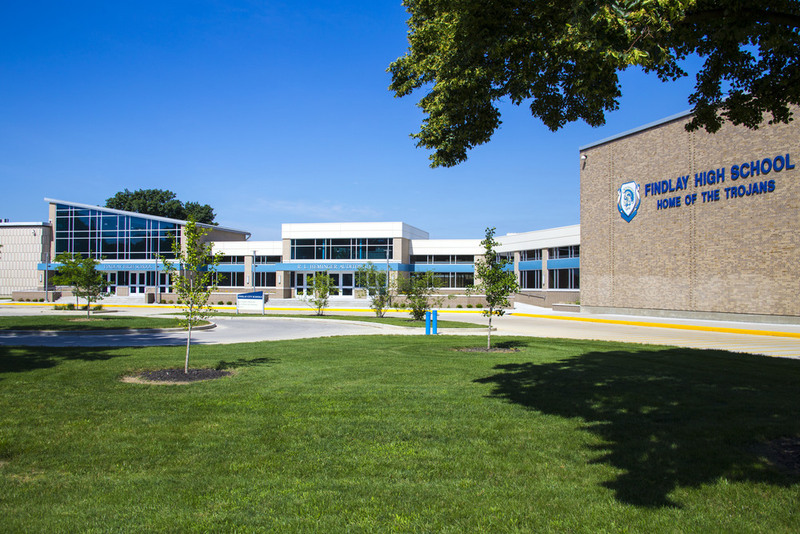 Findlay High School's main entrance received a much needed upgrade in 2014. The $2.7M project, designed by RCM Architects, does not only provide improved student safety and security, but also enhanced aesthetics with a more welcoming environment. The project closed off the existing courtyard with a fully enclosed, climate-controlled corridor. This corridor permanently connects the school's classroom wing to the auditorium and the rest of the north wing classrooms. The new entry/connector features glass walls and a sloped roofline to reflect the aesthetics of the newly completed Millstream Career Center, located just south of the High School. This repetition of lines and construction materials provide continuity and promotes an overall campus aesthetic. Exterior improvements such as new lighting, masonry seat-walls, new stairs, handicapped-accessible ramps, and landscaping finished off the plaza space and provides a welcoming and functional drop-off and pick-up area for students and guests.